Excitingly, a late Christmas present arrived this afternoon from overseas. A set of Holga lenses for my Olympus PEN from my son. 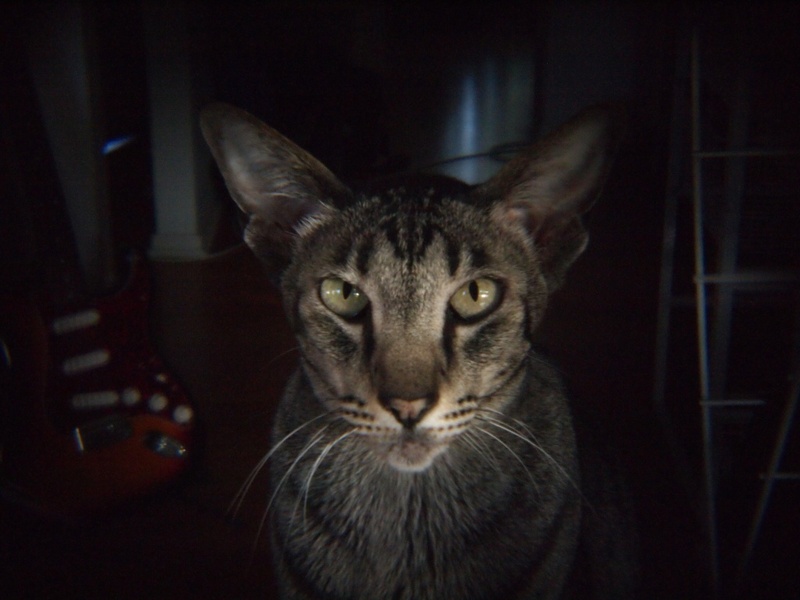 Had to start shooting immediately and this shot of our Oriental cat, Spider, is straight out of the camera. What the? Holga lens for a PEN? tell me more? This is so very cool, lucky you and hope to see many more cool shots. What a strikingly beautiful cat! Awesome light in this! Wow! That's a very interesting effect! Looks like the cats in "Thomasina" and old Disney movie! Very cool! I, too, must know more of these lenses!! Great capture and a very pretty kitty. Have fun with your lenses. you are going to have so much fun with your new lens!!!!!!! What a triangular face! Nice portrait. Very cool! Enjoy your new toys!! Ha! How cool. What a fun attachment! Pretty awesome shot +++. That is a wonderful gift you recieved! So what is the special feature of the Holga lense? whatever it is it gave you a nice shot..and btw beautiful cat. Spider doesn't look too happy! Congrats of the new lens! Oooh, Spider looks very unimpressed! I like the effect though. Very cool. Feels a little surreal, a little alien-ish. Wow. Spider is one diabolical-looking cat! Great portrait of him! Very intense Spider is, I would not want to run into him in the dark. Great capture Peter! Oh this is wonderful. His stare is like ice! awww, what a nice gift! This cat is beautiful!! (doesn't look very snuggily, though! LOL!) great picture. What kind of oriental cat is she? Thankyou for all the wonderful comments. Spider is indeed diabolical and runs the house. Her favourite place is sitting on a bar stool talking to you while you cook. She has a penchant for bacon, ham and tasty cheese, thus the look. She is always ready for breakfast. Orientals were originally bred by crossing Siamese and Abyssinians: are considered to be extreme cats. Great looking kitty and the stare is fantastic! LOL!! Great shot - I can see that you are really going to enjoy the lens! Neat shot! Love the Holga lens--what a great Christmas gift! wow, I saw these on eBay after you mentioned them, cool, do they vignette every time? Do you see the expected results or is it a matter of seeing how they turn out? Super! woah. I'm doing the car boot sales at the weekend in a search for something special. Spider is so the poser. Love the shot. I love this breed, fun shot! Wow! Such cattitude I have never seen! Superb! @5unflow3r Cattitude is definitely the word for it. Cool! Looks like he's got some deep thoughts going on between those ears!